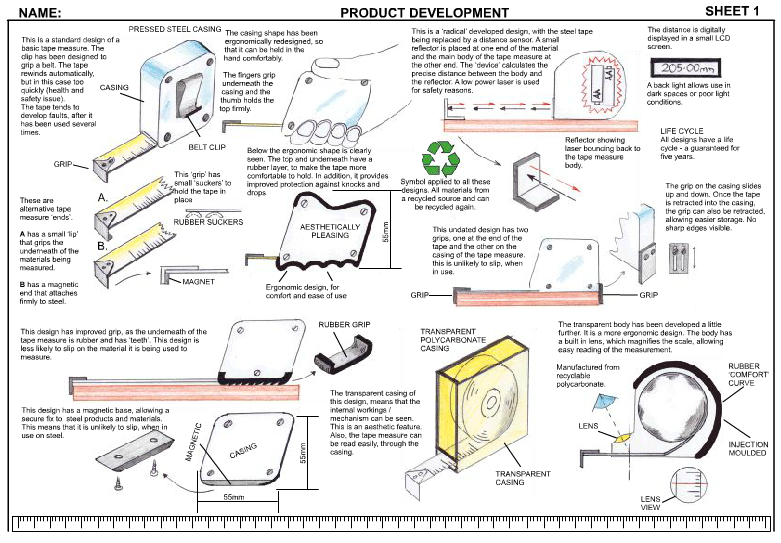 Developing a product involves starting with a basic design and improving it, through sketches notes and photographs, over a number of development design sheets. Outlined below are aspects / key phrases that should be considered during the development section. You may be able to think of many more, appropriate to your product. Rather than dealing with each aspect on separate design sheets, they should be integrated over a number of design sheets. Design is not always linear, such as, an ideas sheet followed by a CAD sheet, then health and safety etc... Designers usually work in an integrated fashion, with many areas appearing on a development design sheet. For example, a development sheet may include sketches, evidence of model making and testing, CAD, reference to the environment, experimentation and a summary of findings. An example of the first development sheet is shown below. This sheet shows the basic design of a 'tape measure', as it is developed into an improved range of ideas. This first sheet is used to show possible improvements to the initial idea. Study the sample development sheet below. How many of the key phrases / aspects shown above, have been mentioned ? 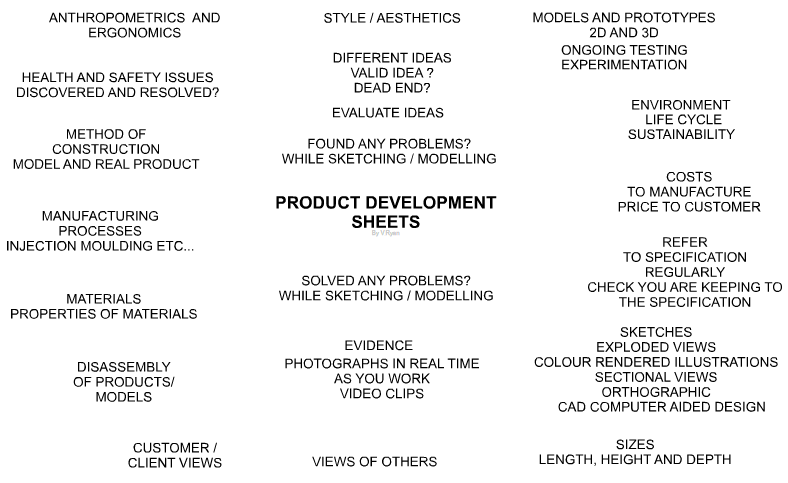 Over the ten development sheets, all these aspects / key phrases (and any more you can think of) should have been supported by sketches, photographs, models and notes.